Clitheroe’s Moorland School are champions of England again. The Ribble Valley School celebrated national glory after lifting the English Schools’ FA PlayStation® Under 14 Boys Small Schools’ Cup at Reading’s Madejski Stadium. Their emphatic success, scoring five goals without reply against London’s Ibstock Place School, from Roehampton, came just days after being crowned Lancashire champions. The ESFA final was part of the PlayStation Schools’ Cup Festival, the culmination of the fifth season of the exciting grassroots partnership between PlayStation and the ESFA. 15 national football finals from Under 12-Under 15 secondary school age groups, featuring both boys’ and girls’ teams, took place across three days. “I’m so chuffed for the boys, it is an unbelievable achievement to win two cups in the same week,” said Moorland School’s Director of football Charlie Jackson. “We reached the English Schools Football Association final (Small Schools’ Cup) a couple of years ago, but lost on that occasion, so this was really something to savour for Moorland, winning it for the first time. Jackson had twice previously led Moorland to national crowns in the Independent Schools Football Association Cup. But it was one-way traffic at the Madejski Stadium, though, as Moorland cruised to victory in front of an enthusiastic crowd who had gathered at the home of the Championship club. Man of the match Jacob Holgate led the Moorland charge with Liam Fannon, Badre Abbou and Jay Baisley also on the goal trail. It means that the Moorland Football Academy can celebrate a sparkling double in 2018 to add to their impressive silverware haul. The Lancashire Cup final, (Under 14) however, proved a far sterner challenge for the 2017 holders before Moorland could hold the trophy aloft again. The final, against Bishop Rawsthorne from Croston and staged at the Lancashire Football Association HQ at Leyland, saw the sides locked together 1-1 at the end of normal time. 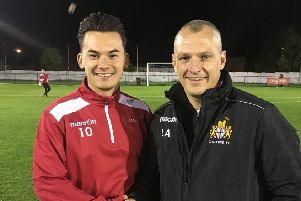 Adam Wharton had fired Moorland in front before half time – but Bishop Rawsthorne levelled it late on to force a gripping final into extra time and then penalties. However, it was Moorland who held their nerve during the spot kick drama and Alfie Walker made sure, striking the winning penalty. Moorland have forged a reputation for nurturing young talent, with former Manchester United striker John Cofie joining Burnley from the Clitheroe School, before the tall Ghanaian’s switch to Old Trafford. Joe Grayson, son of former Preston North End boss Simon, is a Moorland old boy and looks to have a big future ahead of him at Blackburn Rovers. But it is Jackson’s coaching methods that continue to attract nationwide attention. Jackson unearthed Manchester United midfielder Scott McTominay when McTominay attended a coaching school in Preston as a five-year-old. McTominay is now a regular in Jose Mourinho’s squad and made his international debut for Scotland this year against Costa Rica.